Knowing the time is one of the basic necessities in life. This is why watches are so important to men and women. Even though it is easy to look at a cellular phone to get the time, a beautiful chronograph is the classic and timeless way to do it. Throughout time, watches have become favorite heirlooms for families, so taking good care of them is important. At Chasing Treasure, we have several options for men and women who want to protect their investment in watches. They come in many different price points and sizes so that everyone can find and afford one to meet their needs. One thing they do all have in common is that they all will protect watches from dust and other household debris, like pet dander. When storing watches, it is important to keep them covered and out of direct sunlight, which is why all of our watch boxes do have covers and many of them will fit inside of a dresser drawer, a closet, or an armoire. Some people even put their watch boxes into larger cigar humidors because of the constant temperature and humidity settings. Another important consideration to make when storing a watch is whether or not to keep the battery in or to remove it. Batteries have been known to leak, so if you are planning on storing a watch for an extended period of time, removing the battery is a good idea. For day-to-day storage, it is probably not necessary. 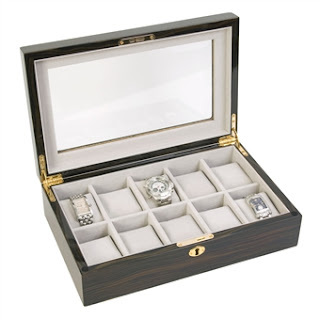 It is also a good idea to keep jewelry boxes, especially those with watches inside of them out of the bathroom. Yes, it is convenient to have jewelry nearby when getting ready in the morning, but moisture will damage watches and other metal items in your jewelry boxes. It could also do damage to the wood that the boxes are made of. If you have a bathroom in your master suite, keep your jewelry box away from the bathroom door, too. Our jewelry boxes that are designed to hold watches include padded watch cushions. These can be easily removed to put a watch on and to take one off. The watch cushions can also be used to store fine bracelets, too. When putting the watch cushions back in the box, it is a good idea not to put the cushions over other pieces of jewelry to avoid scratching. It is also recommended not to store batteries in the watch boxes. We have a few favorite watch boxes for both men and women. One of our favorites for women is the Ivory Leather Watch Case. This beautiful case elegantly store watches in a cushioned environment that closes with a magnetic snap. It is small enough to fit in a suitcase for traveling and pretty enough to leave on a dressing table. For men, our Mens Black Leather Watch Box is a favorite. It holds four watches and has a pocket for extras. It is easy to carry in luggage, too. In order to make mornings more efficient, jewelry, and necklaces especially, needs to be effectively organized. Without organizing your jewelry, you could waste significant time each morning searching for matching earrings and untangling necklaces. At Chasing Treasure, we offer a collection of jewelry boxes that makes necklace storage easy. Storing rings, bracelets, and earrings are easy compared to storing necklaces. There seems to be only one way to store a necklace: by itself. As soon as two necklaces get near each other, they instantly attract each other and get immediately tangled. Fortunately, our collection of jewelry boxes, especially the armoires, will keep them separated so you do not have to worry about the chains getting tangled and twisted. Our favorite jewelry armoires for storing necklaces are the ones with the cabinet doors on the side. The cabinets have hooks on the walls of the armoire and the cabinet doors. As long as you keep one necklace on each hook, then you should not have any problems with necklaces getting tangled. Some of the armoires just have hooks on the walls of the armoire and not on the doors, so if you have a large collection of necklaces it is important to get an armoire with the most hooks. One of our favorite armoires is the Freestanding Antique Brown Large Locking Cabinet in Dark Brown. This cabinet has eight hooks on each side, so it holds plenty of necklaces. The cabinets are hand-lined to protect the necklaces. Each hook is a double, so it is easy to keep sets together by hanging bracelets or rings on the top hooks and necklaces on the bottom hook. The sturdiness of the armoire will keep the pieces from tangling. The drawers all lock and they are lined. The drawers have separated sections for statement necklaces or pearl necklaces that are better off laying flat. There are some necklaces that are best laying in a compartment. If you prefer a smaller jewelry box, our Large Oak Jewelry Box keeps necklaces protected. This jewelry box is like a tablet-top armoire, but much smaller. It has the same style of cabinet doors on the side with hooks for necklaces. One cabinet side is larger than the other so that the necklaces can rest on the floor of the cabinet. The other side has a small pouch to hold necklaces. Each cabinet side has 16 hooks, which can hold a serious number of necklaces. There are also several drawers that can hold other piece of jewelry. The only thing this jewelry box does not have is a lock. Another beautiful jewelry box for necklaces is the Reed & Barton Athena Jewelry Box. This one does not have necklace hooks, but it has plenty of lined drawers to keep statement necklaces and pearl necklaces separate from each other. The lid has a set of pegs and a large pouch to hold pendants. If you have any questions, our customer service department is available to help. We take orders online or via phone. Contact us at cs@chasingtreasure.com or 1-888-804-2542. A tiara is a headpiece that does not have the same weight and heft of a crown. It is often semi-circular in shape, worn to a formal occasion, and circles a majority of the head. Tiaras also are generally covered in jewels. If the tiara is a full circle, then it is technically called a circlet. A crown is an ornamental headpiece that belongs to a king, queen, or other form of similar leader. The crown will usually be circular and will have arches. They are often decorated with jewels that have some significance in the country’s history and in the monarchy’s family. A diadem is another term used to refer to headpieces worn by royalty. The two words diadem and tiara are synonyms, but the term diadem is more grandiloquent than tiara. For example, most people do not talk about prom queens wearing a diadem. It is truly a piece that is meant to be worn by an important person. A bandeau is a type of headband that is somewhat like a tiara. They are highly bejeweled. They tend to be relatively the same height from the edges to the top. A tiara and circlet will have different levels in height, but the bandeau will not. It is much more subtle, but no less beautiful of a piece of jewelry than a tiara. The kokoshnik is not native to England or other European monarchies. It originate in Russia and has been a part of their traditional costumes for centuries. Queen Elizabeth has a beautiful, highly jeweled Kokoshnik that was given to Queen Alexandra. It is a headpiece that is taller than a tiara that reaches a crescendo at the center apex of the piece. Queen Amidala from the Star Wars series often wears headdresses that would be categorized as Kokoshnik pieces. These pieces can be designed simply or they can be heavily and ornately designed so they cover all of the hair, the ears, and much of the back of the neck. The aigrette is a type of ornamentation that is not a crown, but more of a tiny tiara. It does not necessarily have to circle the head. They often have feathers. These were popular during the Roaring ‘20s and resemble something that would be worn by Daisy in The Great Gatsby. They are much smaller than a tiara and often look more like a fancy barrette or other form of hair decoration. A parure is a set of jewels that usually includes a necklace, tiara, earrings, and other pieces. They are often designed to have similar jewels in the same patterns. The complete set usually also includes a brooch, bracelet, and possibly even a ring, with all of the other pieces. These are usually only reserved for royalty and are often given as gifts for major life events, like a coronation, a major birthday, or a wedding. When they are named, they often include the country of the origin of the jewels or of the owner of the piece. The parure does not need to include a tiara to be an officially named parure. At Chasing Treasure, jewelry storage for earrings is one of our specialties. We have one of the largest collections of jewelry boxes and armoires online. Our goal is to make our customers’ lives more organized. We understand that without proper storage, jewelry can become difficult to manage, especially earrings. Fortunately, we have several solutions to make earring storage easy and convenient, because we understand that time is precious. We have small jewelry boxes that are designed just for holding earrings or other small jewelry items. 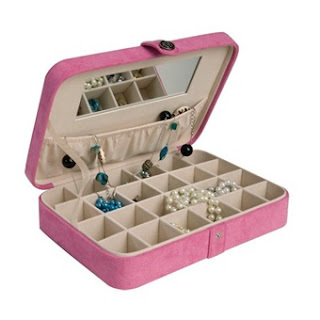 For example, our Pink Earring Jewelry Storage Box is a perfect option, especially for people who need to have a convenient spot. This jewelry box is ideal for travelers, too. Another option for those who prefer a larger jewelry box with plenty of spots for earrings of different sizes is our Contemporary Earring Jewelry Box. This jewelry box has a pair of drawers for bracelets and other pieces. The glass lid keeps the earrings protected from dust and other household debris like pet dander. For an even larger option, our jewelry armoires provide space for earrings, necklaces, and everything else imaginable. 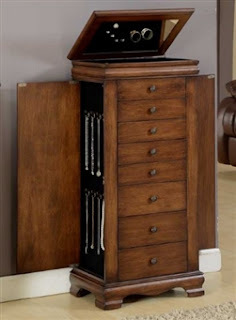 One of our best sellers, the Standing Jewelry Case in Dark Walnut has drawers that can hold numerous pieces of jewelry. It includes ring rolls that are perfect for stud earrings, and compartments for the hoops and statement earrings. Armoires like these have drawers that close and decorative lids for the top compartments. Less expensive options include men’s valet cases and cuff link cases. Travel cases, like the Earring and Cufflink Case, have sueded compartments that can hold pairs of stud earrings and smaller hoops. It also has a pocket that could hold larger statement pieces. Each of the compartments in this case are 1.75” square, which can hold many earrings in a safe, closed space. With small compartments like this, posts are protected from damage. This box closes with a snap to secure everything in place. When you decide to invest in good quality jewelry, storing it should be a priority. Without it, the investment can become damaged and lose value because the pieces no longer are worth wearing. When you have a beautiful pieces, they should be taken care of so you can wear them for many years to come. Many beautiful pieces of jewelry can last for generations, which is one good reason to invest in a high quality jewelry case, valet, or armoire. Traditionally, girls often receive a cute little jewelry box with a dancing ballerina. This type of jewelry box is nice for a short amount of time, but once girls start to grow their collections of jewelry the ballerina box becomes too small. Instead of buying the cute little ballerina box, a substantial jewelry box presents a useful and memorable gift alternative. Chasing Treasure has several perfect options for girls who are building their personal collection of jewelry. The pretty ballerina box is a nice option for young girls - those who have just a few pieces of jewelry. As the collection grows, the ballerina box becomes a sentimental place for special keepsakes - like the little plastic rings, tiny hairbows, and rubbery bracelets. Once that ballerina box becomes full, it is time to move to a jewelry armoire or a glass-topped jewelry box with several drawers. At Chasing Treasure we offer beautiful and durable jewelry boxes that are destined to become lifelong keepsakes. Some of our personal favorites for girls are the jewelry armoires. We have stand-alone armoires and table-top armoires. Since necklaces are favorites with teens, the armoires with necklaces doors are recommended. Teens also love to wear rings and bracelets, so ring rolls and drawers that safely hold bracelets are useful, too. Our Dark Wood Locking Jewelry Box is ideal for girls because it can hold her jewelry and has room for more. For a girl who does not have a huge collection of jewelry, but still needs to have a place that will keep it safe from damage, the standard size jewelry box is useful. Our Black Croc Leather Jewelry Box is an elegant table-top box that has plenty of space for a growing collection. It is stylish and safe, making it perfect for a growing girl who wants her special treasures to last. The glass top window lets her look in on her jewelry while the inside keeps the pieces free from scratches and damage from dust. For the girl who gets to travel with her family, there is a small case that has room for a few favorite pieces. Even though many girls love feminine colors, the elegant options like black and brown will make a young girl feel mature and appreciated for the young woman she is becoming. When the boxes have glass tops and locks, she will recognize that her treasures are truly special. The locks proves to the young girl that her treasures are valuable and the glass top proves that they are beautiful, too. It is important to remember that the jewelry boxes that have glass tops usually do not have mirrors - which is another favorite feature for girls who like to see themselves in their favorite jewelry pieces. 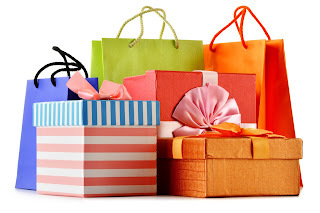 In today’s world, gifts are often given to satisfy a current need or want. But, an elegant and large jewelry box or armoire is a gift for the past, present, and future. Girls can use them to keep their favorite childhood treasures and they can use it accumulate more as they grow. At Chasing Treasure, we strive to meet the needs of growing jewelry collections, so why not start protecting the treasures of the youngest collectors.